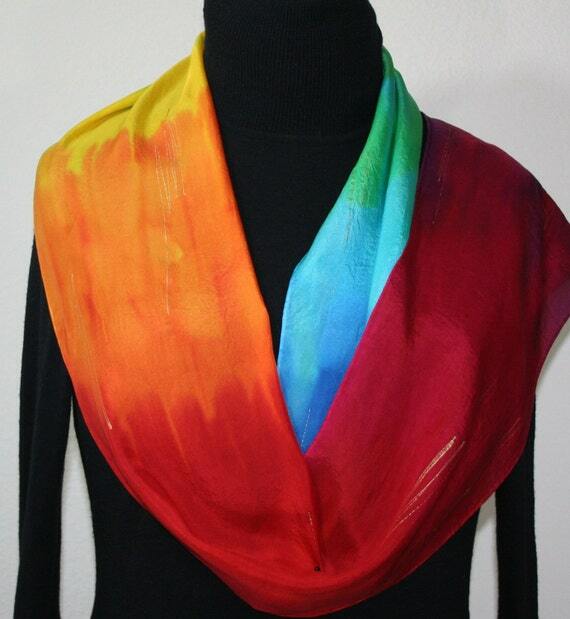 Silk Scarf Red Orange Blue Hand Painted Handmade Shawl RAINBOW SMILE, Silk Scarves Colorado. Select Your SIZE! Spring Scarf, Summer Scarf. Birthday Gift, Christmas Gift, Anniversary Gift. Bridesmaid Gift, Valentine Gift. Gift-Wrapped. Elegant Handmade Silk Scarf. Hand Dyed Silk. Handmade in Colorado, USA. 100% silk. This is a 100% smooth China silk scarf featuring melting segments in vibrant colors: in red, orange, yellow, green, blue and purple; decorated with very thin metallic accents in gold. This is a beautiful and elegant silk scarf that makes a stylish accessory to any outfit. 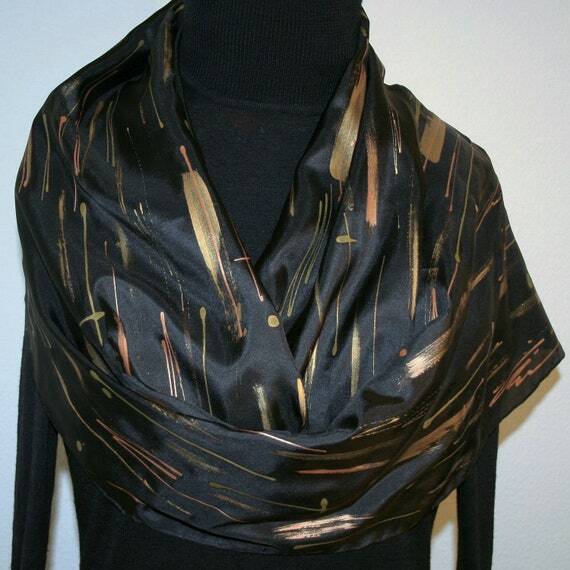 Black Gold Bronze Silk Scarf Hand Painted Silk Shawl SHOOTING STARS, by Silk Scarves Colorado. Select Your SIZE! Birthday Gift, Christmas Gift, Anniversary Gift. Bridesmaid Gift, Valentine Gift, Graduation Gift. Gift-Wrapped. Elegant Handmade Silk Scarf. Hand Dyed Silk. Handmade in Colorado, USA. 100% silk. 100% smooth silk scarf in black, featuring thinner and thicker brushstrokes in golden, bronze and rust on a black background. The scarf is very elegant, with very clean lines and would make a perfect accessory to a more formal outfit. NOTE: THAT SAME DESIGN CAN ALSO BE CREATED IN BLACK AND SILVER - you just have to select your preferred option when placing your order. Green Emerald Olive Silk Scarf Hand Painted Silk Shawl GOLDEN MEADOWS, by Silk Scarves Colorado. Select Your SIZE! Birthday Gift, Christmas Gift, Anniversary Gift. Bridesmaid Gift, Valentine Gift, Graduation Gift. Gift-Wrapped. Elegant Handmade Silk Scarf. Hand Dyed Silk. Handmade in Colorado, USA. 100% silk. This is a 100% smooth silk scarf in sage green - featuring melting segments in various shades of green: dark pine, emerald, antique green (shade of olive), fern green, and lime. 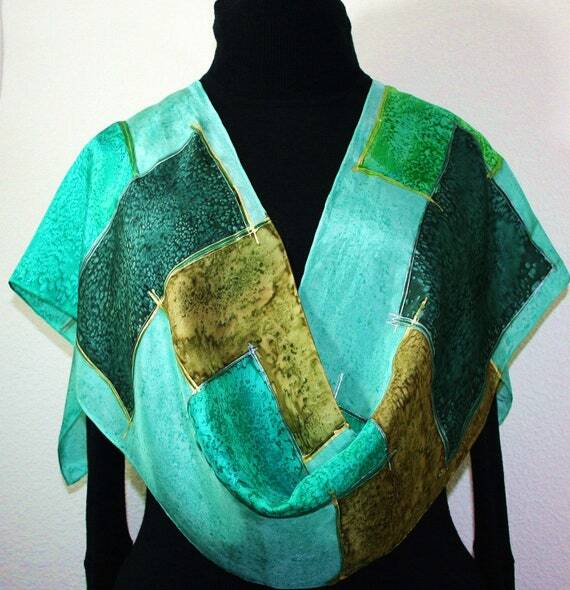 The scarf is playing on the contrast between the silvery and the golden feel in the different shades of green. Decorated with thin accents in both brass and silver. 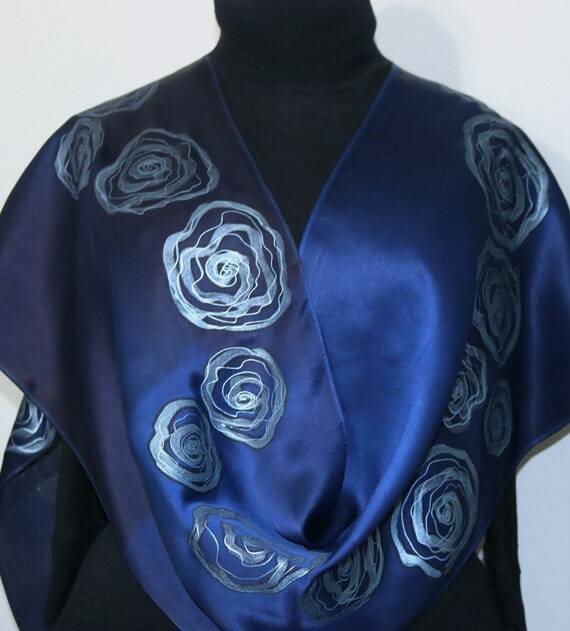 Silk Scarf Navy Blue Hand Painted Satin Silk Shawl SATIN ROSES, by Silk Scarves Colorado. Select Your SIZE! Birthday Gift, Christmas Gift, Mother Gift. Anniversary Gift. Bridesmaid Gift, Valentine Gift. Gift-Wrapped. Elegant Handmade Silk Scarf. Hand Dyed Silk. Handmade in Colorado, USA. 100% silk. READY TO SHIP Immediately - the perfect gift! This is a 100% Silk Satin scarf - very chic and elegant, in shades of dark royal, sapphire blue, and navy blue; decorated with abstract roses in metallic silvery blue. It is a very elegant scarf that would make a perfect accessory to a more formal outfit. SIZE: This is a size LARGE scarf, allowing generous layering around the neck - size: 14" x 72" (35 cm x 183 cm). This is original size - slight shrinkage occurs due to the steam-setting process. IN STOCK - Silk Scarf Black Gray White Hand Painted NIGHT CHIC, isize 14x72", Birthday Gift, Bridesmaid Gift, Christmas Gift, by Silk Scarves Colorado. Handmade Silk Scarf. Hand Dyed. Handmade in Colorado, USA. 100% silk. Gift-Wrapped. The scarf can also be personalized for the recipient (name, monogram, etc.) - if you are interested, please message me the details, and I will be happy to create the scarf as you request it. This is a 100% Habotai silk (aka. 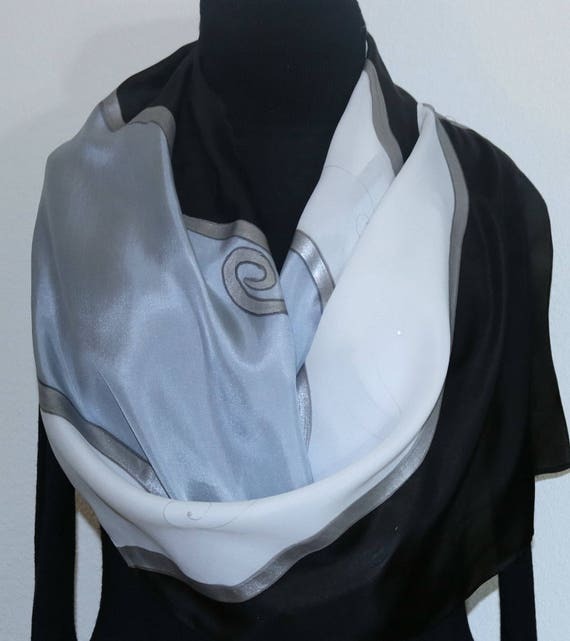 Smooth silk) scarf featuring contrasting segments in black, white, and silver gray - positioned in random order. Outlines are done in metallic silver. This is a chic silk scarf that makes a great accessory to any outfit. 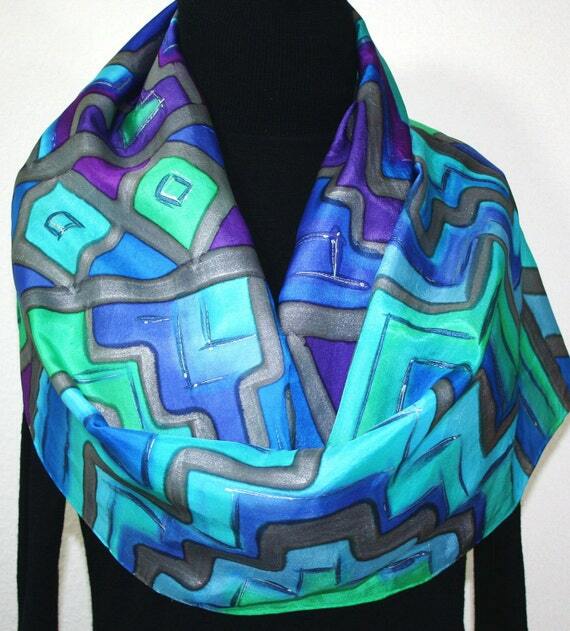 Silk Scarf Teal Blue Purple Hand Painted Silk Scarf ANDEAN LEGENDS, by Silk Scarves Colorado. Select Your SIZE! Birthday Gift, Christmas Gift, Anniversary Gift. Bridesmaid Gift, Valentine Gift, Graduation Gift. Gift-Wrapped. Elegant Handmade Silk Scarf. Hand Dyed Silk. Handmade in Colorado, USA. 100% silk. This is a 100% smooth China silk scarf in black, featuring Andean inspired stair-like motifs in bold shades of turquoise, blue, purple and periwinkle. Outlines in pewter; decorated with accents in silver. It is a very chic and elegant silk scarf. 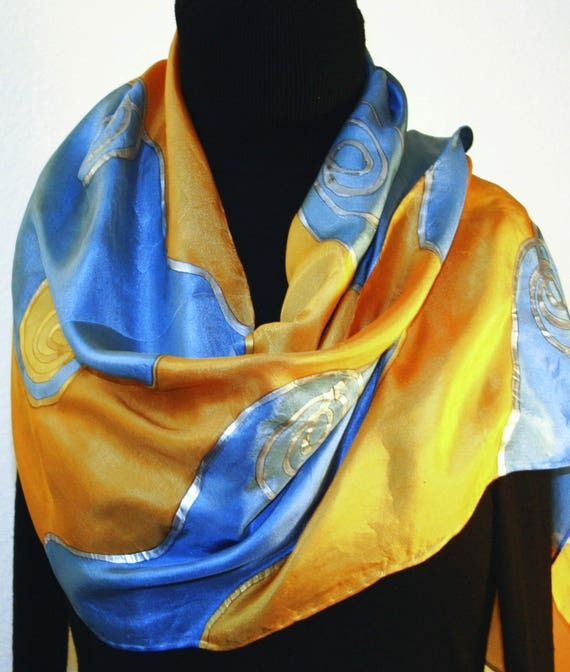 Silk Scarf Yellow Azure Blue Hand Painted Silk Shawl RIVER SUNRISE, by Silk Scarves Colorado. Select Your SIZE! Birthday Gift, Christmas Gift, Anniversary Gift. Bridesmaid Gift, Valentine Gift, Graduation Gift. Gift-Wrapped. Elegant Handmade Silk Scarf. Hand Dyed Silk. Handmade in Colorado, USA. 100% silk. This is a 100% silk scarf, playing on the contrast between cold and warm colors - reminiscent of the contrast of gold and silver. it is featuring alternating segments in cold azure blue and warm golden yellow; decorated with golden and silver spirals. NOTE: Shades of colors can slightly fluctuate in each new scarf, as it is all created by hand. 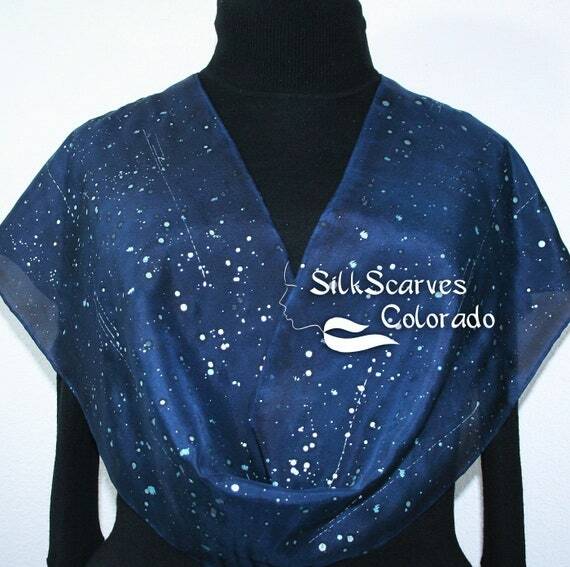 Silk Scarf Navy Blue Ink Blue Silver Hand Painted Shawl STARRY SKIES, by Silk Scarves Colorado. Select Your SIZE! Birthday Gift, Christmas Gift, Anniversary Gift. Bridesmaid Gift, Valentine Gift, Graduation Gift. Gift-Wrapped. Elegant Handmade Silk Scarf. Hand Dyed Silk. Handmade in Colorado, USA. 100% silk. This is a 100% smooth China silk scarf, featuring shooting silver stars on a background in deep shades of ink blue and navy blue. 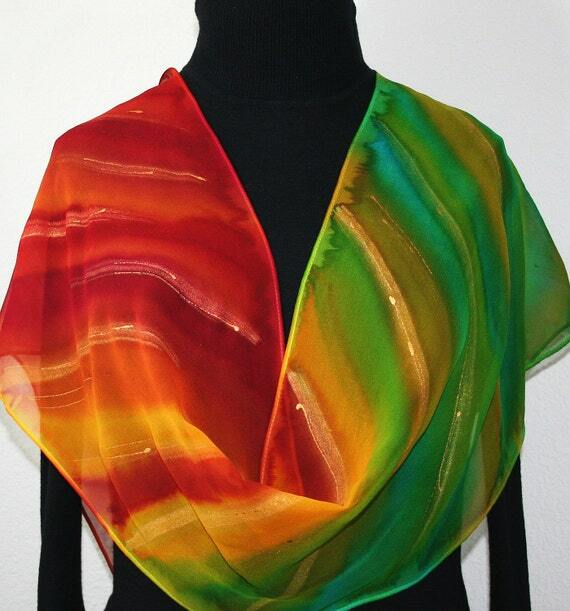 Red Yellow Green Chiffon Silk Scarf Hand Painted Shawl SHINING RAINBOW, by Silk Scarves Colorado. Select Your SIZE! Birthday Gift, Christmas Gift, Anniversary Gift. Bridesmaid Gift, Valentine Gift. Gift-Wrapped. Elegant Handmade Silk Scarf. Hand Dyed Silk. Handmade in Colorado, USA. 100% silk. 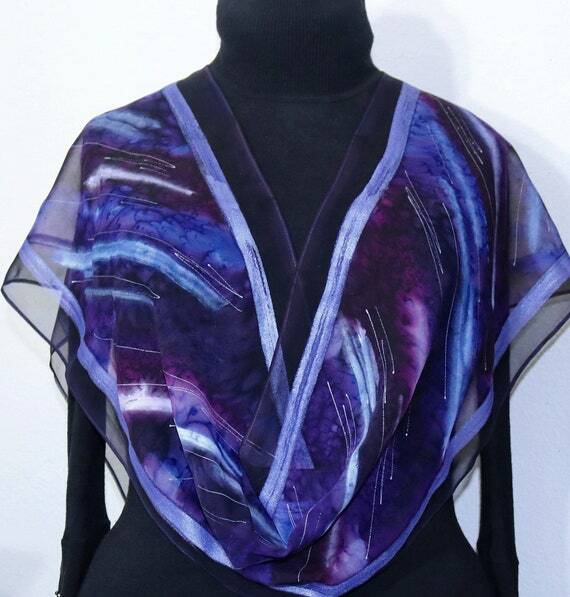 Silk Scarf Purple Lavender Handmade Hand Painted Shawl PURPLE RAIN, by Silk Scarves Colorado. Select Your SIZE! Birthday Gift, Christmas Gift, Anniversary Gift. Bridesmaid Gift, Valentine Gift, Graduation Gift. Gift-Wrapped. Elegant Handmade Silk Scarf. Hand Dyed Silk. Handmade in Colorado, USA. 100% silk. This is a 100% Chiffon silk scarf in shades of purple, amethyst, aubergine and lavender; decorated with accents in lavender and silver. The border of the scarf is in dark aubergine.